To get ahead, make up the filling and refrigerate for up to two days. 1. Preheat the oven to 200C/400°F. 2. Heat 1 tbsp of oil in a large skillet or pan and sauté the leeks until softened, then add the garlic and 2 tbsp thyme leaves, and cook for a further three minutes. Scrape into a large mixing bowl. 3. Add 1 tbsp to the skillet and sauté the mushrooms until they release their liquid; cook this off and add the soy sauce. Cook a further minute and then scrape into the bowl. 4. Now for the chard or spinach. Heat the final tablespoon of oil over medium-low and sauté the chard or spinach. Drain off excess liquid and scrape into the bowl. You could also steam these instead of sautéing. 5. In a jug, mix together the crème fraiche or vegan cream, vegetable stock powder and whole grain mustard. Add this and the rice to the bowl, mixing all well. At this point you can pop this in a sealed container and refrigerate for up to two days. 6. For the optional baklava crunch layer, melt 50g of butter or coconut oil in a small pan, add the honey, walnuts, barberries/cranberries and remaining thyme leaves. 7. Melt the 25g butter separately. 8. 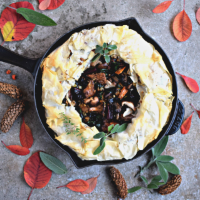 To assemble, line a cast iron skillet with the phyllo pastry, staggering the placement of the sheets to create jagged angles. Pile in the filling. Draw over the overhanging pastry, leaving the centre open. Lift the top layer away from the filling and brush or daub on the buttery savoury baklava filling, if using. Fold back over. Brush with the extra butter. 9. This is where it might seem strange. Place the skillet on the hob/stovetop and on low-medium, heat the pie for eight minutes, lighting gently to check it isn’t burning. Adjust the heat as needed. This will help the phyllo bottom get a head start. 10. Bake in the preheated oven for 30 minutes, covering lightly with foil if needed. 11. Serve warm in generous wedges with loads of colourful vegetables, rainbow carrots and flower sprouts with roasted garlic-tahini drizzle, and homemade cranberry sauce. Cranberry sauce is mandatory!